Banking is their trade. Power is their goal. Love is their weakness. Some families are united by love, others by tragedy or strokes of fate. And then there are families like the Rheinbergs, united by boundless ambition, ruthless power and fabulous wealth. To the owners of the distinguished, gold-class Rheinberg Bank, feelings aren't important where money is involved - and love isn't worth a cent if power is at stake. Trouble enters the family in the form of Mona Sailer and her daughter Ariane. Mona is Markus von Rheinberg's sister, who turned her back on her family 30 years ago and raised her daughter alone in Spain. But after discovering her true origins, Ariane vows to claim her share of the family's fortunes - which also means navigating the treacherous waters of her family's established power structures. Mona returns to the family fold only to stand by her daughter, even though she hardly has to: Ariane has all the brains and cunning of a Rheinberg. Dark secrets from the family's past are brought to light by various victims of the mighty Rheinbergs. And new assaults on the family's wealth and standing are undertaken by others, who covet the family's immense fortune. 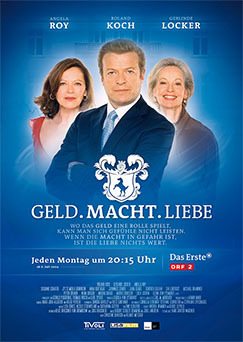 But as these ordeals and the international financial crisis threaten to destroy the family and its business, the Rheinbergs realize that they can only successfully face new challenges, both global and local, if they overcome their differences and work together - perhaps the biggest challenge of all.